VNC apps are great for remotely controlling your computer from your iPad to expand your work options. But there’s another type of remote access that is very handy: using the iPad as a second screen for your computer, both to view your computer screen and to interact with it (using touchscreen taps in place of mouse clicks). Both Avatron Software’s $9.99 Air Display and Rahul Dewan’s $14.99 Duet Display do just that. If you put your iPad on a stand next to your computer screen so that both are in the same plane of view, this setup can work well to let you put secondary application windows on the iPad. 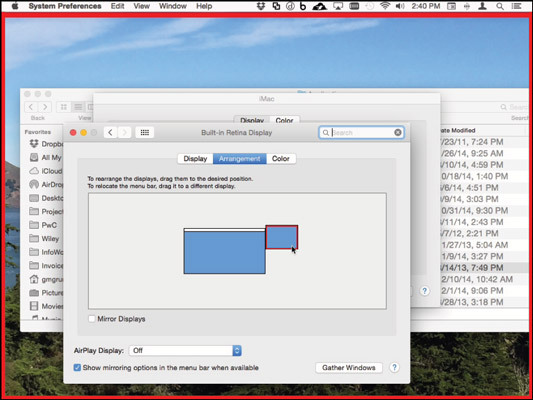 The Mac’s OS X has long allowed such an extensible Desktop screen across multiple monitors if physically connected to your Mac, and Windows added a similar capability in recent years. But neither does so natively with tablets like the iPad. Air Display works over a network connection, so there can be some delay in what appears on your iPad’s screen. Duet Display works through a direct connection between your iPad’s Lightning or Dock port and your Mac’s USB port, so there’s no lag — but it does not work with Windows PCs, just Macs. In both Air Display and Duet Display, you move the pointer between the iPad’s screen and your computer’s screen. That can take some getting used to. Use the Mac’s Displays system preference or the PC’s Display control panel to manage how the screens are related to each other, which determines which side of each screen flows into the other. From your computer, drag windows from one screen to another to position them where you want them on the extended Desktop. Some applications, such as Adobe’s Creative Suite, use a docked set of panels that will not move to a different screen if the application’s windows are moved. On the iPad, Air Display adds a row of Mac or Windows buttons to the onscreen keyboard so that you can use keyboard shortcuts on your iPad to work with your computer. There’s a keyboard icon at the bottom of the Air Display screen to open that keyboard. Air Display has to be on the same local network as your computer — it doesn’t work via a remote Internet connection. At the website, you can find downloads for OS X and Windows to install the Air Display clients. These are not the files needed to extend your computer’s screen to your iPad. Instead, they let a Mac or a PC act as a second screen to another computer, and they cost $19.99 per computer. 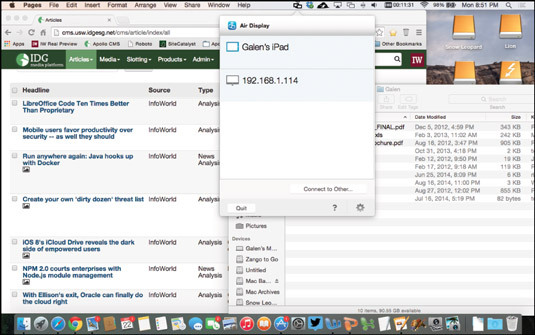 You can also connect to another tablet or computer by entering its IP address. You also use this host app to end the Air Display session and gather all your open windows back on your computer’s screen. You can see the Air Display host app at the top of the screen. The Duet Display app does a little less than Air Display does: It simply makes your iPad an additional Desktop screen for your Mac. Drag app windows from your main Mac screen to the iPad screen, as you would drag windows from one Mac screen to another, to arrange your extended Desktop as desired. You can use the iPad’s touchscreen to select items on the screen, but Duet Display assumes that you’re controlling everything from your Mac’s keyboard and mouse. 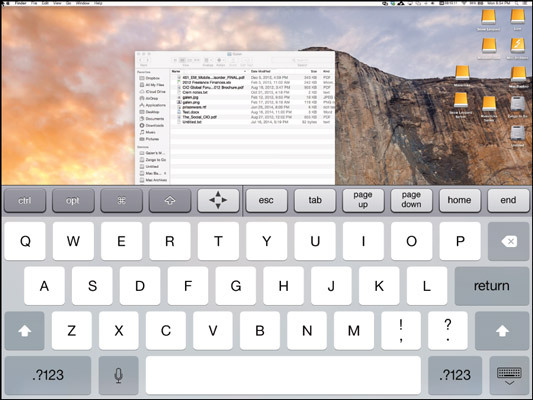 Thus, selecting text from the iPad screen does not open the iPad’s onscreen keyboard as it does in Air Display — you have to use your Mac’s keyboard. But you can tap and double-tap items from the iPad screen as if it were a mouse. To use Duet Display, you must install a free Mac app, as well as the App Store’s Duet Display app on your iPad. (A reboot may be required.) Then, plug your iPad into your Mac via its Dock or Lightning connector, open the Duet app on your iPad, and wait a moment for the iPad to function as a second screen for your Mac. If the iPad does not display your Mac’s screen, unplug the connector, wait a few seconds, and then plug it back in — Duet Display may not work if you plug the iPad into the Mac before the Duet Display app is running on your iPad.